This essay rounds up arguments for looking at gold as a reasonable investment: 1) The dollar; 2) China; 3) declining production; 4) inflation; 5) deflation; 6) global short-term interest rates; 7) uncertainty and distrust in government; and 8) flight to safety. 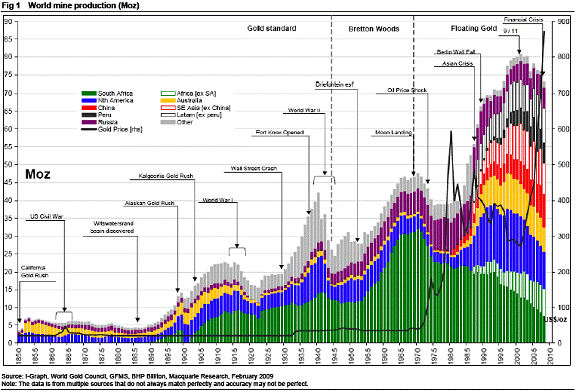 King also claims that another reason that gold will hold its value is declining production. It turns out he might be. 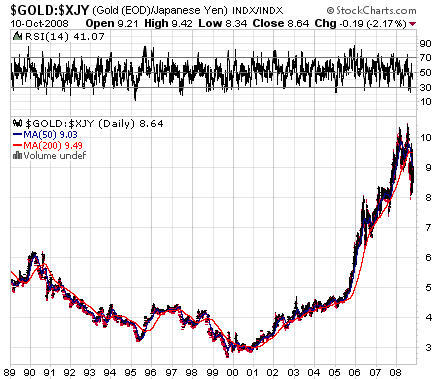 Note 1: Some of the best recent arguments I've heard against investing in gold are written by Vitaliy Katsenelson. Read this, this, this and this. Note 2: As Zero Hedge has shown, newly-declassified federal documents prove that gold prices have been manipulated, at least in the past. If the strategy of artificial price suppression is continuing to the present, if this is widely publicized, if such publicity causes someone like Congressmen Alan Grayson, Brad Sherman, Ron Paul, or Dennis Kucinich (hello - congressional aides?) to raise a ruckus in Congress, and if Congress as a whole votes to ban such a practice, then the price of gold would presumably rise - as it would no longer be suppressed. That's a lot of ifs. However, Schoon argues that gold manipulation will end because the world's central banks (and their primary dealers) will no longer be able to afford it. Specifically, he argues that they will simply run out of money to keep playing the game. Where does silver come into play on this scale of flight to safety? If the stuff at zerohedge is believable, a lot of people who have invested in gold (as a "paper asset" in an unallocated account rather than taking physical delivery) may be disappointed. It is asserted that unallocated accounts are no better than unsecured loans to the PM firm that claims to have sold you the metal. nice blog!!!!!!!!!!! i really like it. Smith says about Buying Gold Their parting remark is that they are shopping these same requirements with twenty other retailers and are going to buy from the one with the lowest price. There's a third option to physical gold vs. a paper asset in an unallocated gold account; and this is gold mining stocks (such as GG, ABX, NEM, and AUY), which tend to trail by about six months the price movements in physical gold and therefore are worse than physical gold when physical gold prices are going up, but better than physical gold when physical gold prices are going down. Over short periods of time, the mining stocks are comparable to physical gold, but over lengthy periods the mining stocks are now actually a bit better than physical gold because we are already well into a period of rising gold prices, and the mining stocks will keep rising for months after any sustained decline in gold prices takes effect. Thereby the mining stocks will keep rising even during a sustained gold-price decline. Therefore, the mining stocks are actually safer in the long run right now, because we've long been in a rising-price gold market. If we were instead in a long-term falling-price gold market, gold mining stocks would now be a less-good investment than is physical gold; but that's not the situation at the present time.